In 2015, eight companies from mainland China and Hong Kong announced new investments in Tennessee, more than double the number of investment announcements in the state from greater China in 2014, according to TN-China Network research. In addition, four companies from mainland China and Taiwan announced expansions in Tennessee in 2015. The announced investments and expansions last year amount to more than $319 million in committed investments and more than 1,531 jobs to be created in Tennessee. Many of the announced investments are to establish the companies’ first US facility or headquarters. The investment and expansion announcements came in a range of industries, but particularly reflected Tennessee’s strength in automotive and advanced manufacturing. The industries included automotive parts (five companies), tire mold manufacturing, and aircraft, as well as refrigeration and air conditioning, plastic injection molding, porcelain tile, foam products and bedding, and musical instruments. All the new non-expansion investments in Tennessee announced in 2015 were greenfield investments (to establish new facilities), a shift from recent years when most investments in Tennessee from greater China were through mergers and acquisitions (M&A) of existing companies. This is also in contrast to the national trend, where M&A activity accounts for the majority of mainland Chinese foreign direct investment (FDI) in the US. Ownership of the companies that announced investments in Tennessee in 2015 is a mix of private, public, and state-owned, including some joint ventures, with 10 of the investments and expansions coming from mainland China, one investment from Hong Kong, and one expansion from Taiwan. The new non-expansion investments were relatively evenly spread across the state (two in West Tennessee, and three in both East and Middle Tennessee), while all the expansions were located in Middle Tennessee. Out of all the regions in the US, the South ranks first overall in attracting investment from mainland China, according to a 2016 report by the National Committee on US-China Relations and the Rhodium Group. However, compared to other states and to Tennessee’s competitiveness in attracting global FDI overall, Tennessee has received relatively low levels of mainland Chinese investment. For example, the report states that while Tennessee attracted $480 million cumulative investment from mainland China from 2000-2015, nearby North Carolina received $5.7 billion, the fourth highest in the US. 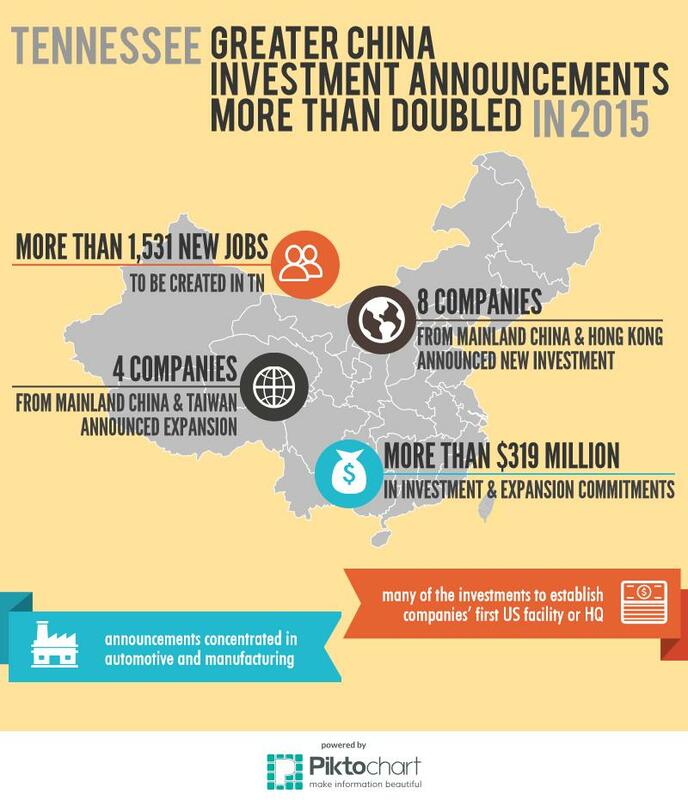 Tennessee’s increase in investment from greater China in 2015 coincided with rising labor, transport, and energy costs in China as well as a relaxation of China’s foreign exchange and outbound investment regulations. It is unclear how outbound Chinese investment will be affected by the recent “foreign currency clampdown” by the Chinese government in response to the large outflow of capital from China that began in August 2015 (but has recently eased). Sentury Tire Americas – It was reported on February 12, 2015, that this Qingdao-based tire manufacturer is establishing a warehouse and distribution facility in Memphis to service its customer base in the northeast and central states. Cirrus Aircraft – This mainland China state-owned aircraft manufacturer announced on May 6, 2015, that it would establish its first customer experience “Vision Center” at the McGhee Tyson Airport in Blount County near Knoxville. The company broke ground on the Vision Center in November 2015. Factory Service Center operations at the Vision Center are slated to open in the first half of 2016, while the Vision Center Grand Opening is projected for early 2017. Yanfeng US Automotive Interior Systems – The largest global auto interiors manufacturer, headquartered in Shanghai, announced on July 7, 2015, that it is establishing new manufacturing operations in Chattanooga to support the Volkswagen plant there. Yanfeng will supply interior components, including floor consoles, instrument panels, and trunk trim. Production is slated to begin in late 2016. Innovate Manufacturing – This Dongguan-based plastic injection molding company and contract manufacturer announced on August 24, 2015, that it would establish its first US headquarters and manufacturing facility in Knoxville. The ribbon cutting for the facility took place October 16, 2015. This spring the company expects to have all of its manufacturing equipment in place and be ready to operate at full capacity. Triangle Tire North America – It was reported on October 28, 2015, that this Weihai-based tire manufacturer is establishing its North American headquarters in Franklin. The ribbon-cutting ceremony was held November 2, 2015. Wonder Porcelain – This Dongguan-based porcelain tile company announced on November 3, 2015, that it is investing $150 million to build its first US manufacturing facility in Lebanon – the largest capital investment made by a Chinese-based company in the state’s history. Construction on the plant is underway and expected to be operational by late 2016. Sinomax USA – This Hong Kong-based foam products manufacturer announced on November 10, 2015, that it is locating its first US manufacturing facility in La Vergne near Nashville, creating 350 jobs – the largest jobs commitment made by a Chinese-owned company in Tennessee’s history. The facility will produce various foam products, including foam bedding, to serve the North American market. DunAn Precision Manufacturing, Inc. – It was reported on November 18, 2015, that this Hangzhou-based manufacturer will locate its first US factory in Memphis, moving output from China to manufacture aluminum heat exchangers used in refrigeration and air conditioning for the North America market. The move will occur in early 2016. KHS America – This Taiwan-based manufacturer and distributor of musical instruments, with its US headquarters and warehouse in Mt. Juliet near Nashville, announced on April 30, 2015, that it will invest $3.7 million to add onto its current location and create 67 new jobs, expanding its Mt. Juliet workforce by 75%. TWB Company – This manufacturer of tailor welded automotive products, with a location inside the Nissan plant in Smyrna near Nashville, announced on June 3, 2015, that it is investing $18 million to establish a second location in Antioch, creating 41 jobs. TWB Company is a joint venture of Worthington Industries and Wuhan Iron and Steel Company in Wuhan, China. SaarGummi Tennessee Inc. – This mainland China-owned (Chongqing) automotive door and window seals manufacturer in Pulaski announced on October 28, 2015, that it is expanding its manufacturing operations by purchasing additional finishing equipment and improving existing infrastructure. The expansion will create 161 new jobs with an investment of over $24 million. Global Manufacturing Services, Inc. – This mainland China-owned (Shandong) tire mold manufacturer in Columbia announced on December 21, 2015, that it is investing $620,000 in new equipment upgrades at its Columbia facility, creating 43 new jobs. For a full list of companies from greater China that are invested in Tennessee, visit the TN-China Network Resources page. Thank you to experts at the Rhodium Group, Tennessee Department of Economic and Community Development Center for Economic Research in Tennessee, and the Middle Tennessee State University Business and Economic Research Center for their input during TN-China Network’s research for this report.